A recent issue of Woodworker’s Journal had several “holiday gift” projects, including a tray for doing jigsaw puzzles with slide out drawers to hold the extra parts. My wife saw it and put in her order. I thought it would be a simple project, and if I’d stuck to the plans it probably would have been. But the one in the magazine article was designed for only 500 piece puzzles. My wife and son take on jigsaw puzzles with at least 1,000 pieces at a minimum, the most recent one was a 2,000 piece puzzle. Personally, it makes my head hurt just thinking about fitting 2,000 little pieces together. As it turns out, making the tray had the same effect. This should be an easy project, but scaling it up made it unwieldy and floppy to boot. I tried to reinforce it, but it wasn’t a lot of fun to put together, and I ended up having to made some “adjustments” to get it to work at all. But I persevered, and it’s done. Not fancy, not elegant and definitely not my best work. But done, and sometimes that’s the name of the game. 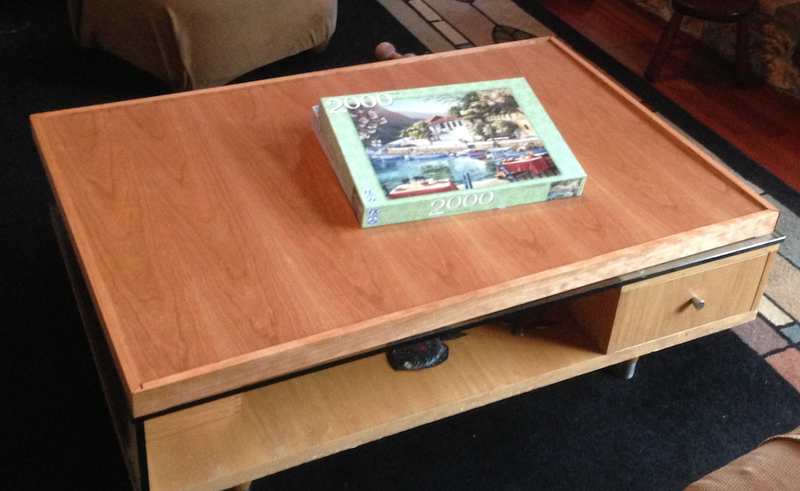 Hey, I have an idea…MAKE A PUZZLE TRAY! My wife and son came home and immediately broke out a 2,000 piece puzzle and are sorting piece as I type. Did you have enough aspirin to finish the job?